If you have any queries, please telephone the Box Office + 44 (0) 1454 218375. To redeem your Gift Voucher please visit the online ticket kiosk of our website which will be open for Priority Booking (those who have previously purchased tickets in advance) on Monday 7th January & Public Booking on Monday 14th January 2019. The recipient will need to redeem the voucher using the Voucher Code. 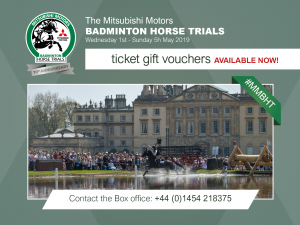 Full value of the Gift Voucher must be redeemed before advanced booking closes on the 23rd April 2019. Tickets will then be emailed or posted depending on the ticket type. (All tickets are subject to availability). The Gift Voucher cannot be redeemed at the gate so must be used by the closing date above, is non-refundable and cannot be exchanged for cash. Please see Gift Voucher Terms & Conditions.